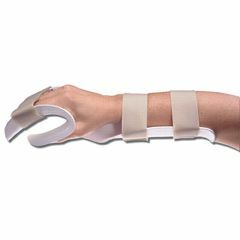 AliMed Deluxe Functional Position Splint is the classic way to splint the hand after a stroke--with thumb in full opposition, wrist in 30° dorsiflexion, and MP joints at approximately 80°. Made of adjustable thermoplastic. Choose the traditional splint with straps attached, or select the splint that comes with a comfort-enhancing AliFleece™ Glove. Includes wrist straps that secure in a figure-eight for firm, comfortable hold. Sizing: Measure the circumference of the hand at the MP joints. Sizing: X-Small: 5 ¼" - 6"
Small: 6 ½" - 7 ¼"
Medium: 7 ¼" - 8 ¼"
Large: 8 ¼" - 9 ¼"
How do you measure the circumference of the hand at the MP joints? Also what are the MP joints?